The Finding Nemo sequel Finding Dory opens today. 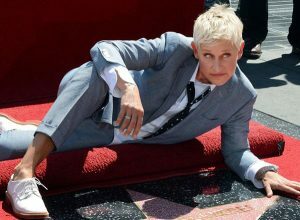 The 3D animated comedy stars Ellen DeGeneres reprising her role as the adorable little fish Dory, who is on a quest to be reunited with her family. The MediaMine library includes media from Ellen’s official Hollywood Walk of Fame Star ceremony from September 2012. See the whole collection at MediaMineLicensing.com. And download the FREE Official Hollywood Walk of Fame App here to play trivia and see photos and videos from the iconic Hollywood Walk of Fame ceremonies.